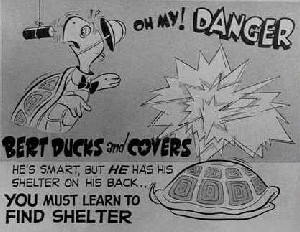 TNA: 40+ New Russian ICBMs This Year, U.S. Revives "Duck and Cover"
40+ New Russian ICBMs This Year, U.S. Revives "Duck and Cover"
WASHINGTON (The Nil Admirari) - President Barack Obama announced today America's public schools will be introduced to the old "Duck and Cover" film and begin duck and cover drills starting at the beginning of the 2015-2016 school year. The decision comes only two days after Russian President Vladimir Putin announced Russia would be constructing over 40 new nuclear intercontinental ballistic missiles (ICBMs) by the end of 2015. 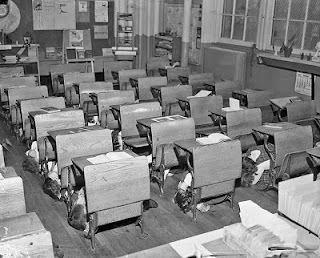 "America's student are going to love "Bert the Turtle" as he instructs them to duck under their desks for protection from a nuclear explosion. It's the best method of protection they have if they are not in the nuclear fire ball," stated Obama. Obama also wanted everyone to know desks were not the only place Americans could shield themselves from a nuclear explosion. "Logs, large holes or crevices, tables, and a whole host of other things can also be used for nuclear bomb protection. Just make sure you close your eyes and cover any exposed skin to protect both from the blast," explained Obama. Russia was quick to announce its scientists were working on ways to get around U.S. nuclear defenses like duck and cover.